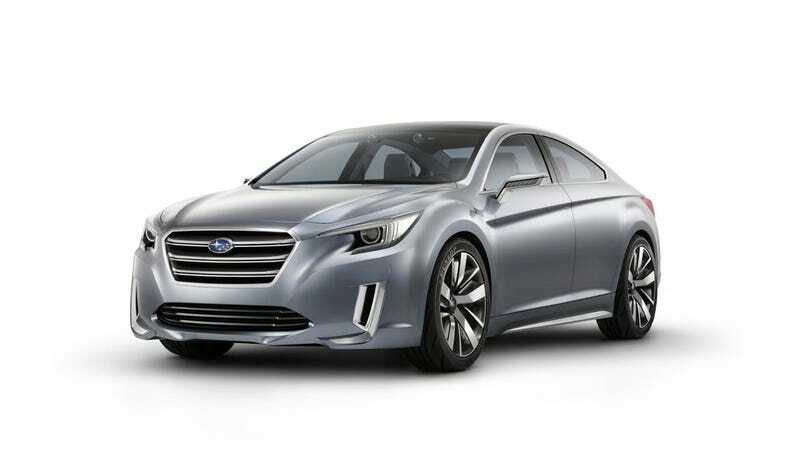 Here is your new Subaru Legacy, sort of. Subaru has announced that it's latest Legacy Concept will be shown at the LA Auto Show. Going from the previous Legacy Concept, this is probably what the next-generation of the car will look like when it goes on sale, likely late next year. The Legacy is the next boxy, upright sedan to go the swooping roofline route and it makes the car look like a Hyundai Sonata from the side. That could be a good move, though, since Hyundai sells a lot of Sonatas and Subaru wants to sell even more cars than it has been this year. Specific details of the Legacy Concept haven't been announced yet. But get used to that grille, since Subaru's probably going to put it on the front of all their cars soon. It's a sharp-looking car, and I hope it stays that way.